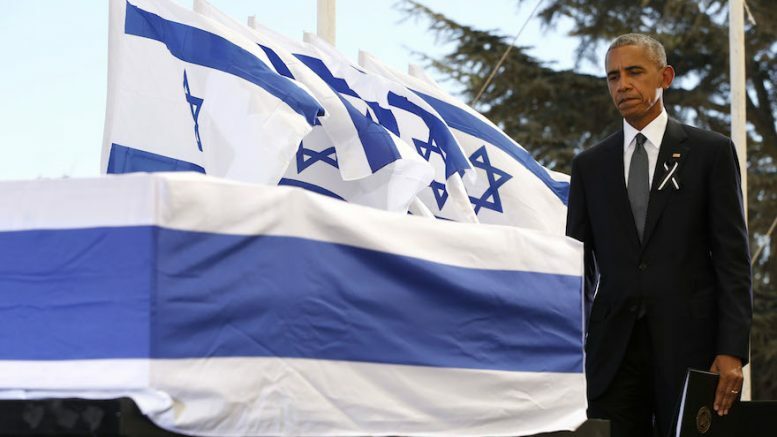 JERUSALEM (JTA) – Israeli and world leaders gathered atop Mount Herzl on Friday to say goodbye to Shimon Peres, Israel’s last founding father. In addition to fond personal recollections, many of those who took the stage alongside Peres’ Israeli-flag-draped coffin offered their visions of the peace that eluded the former president and prime minister. Peres died early Wednesday at 93 after suffering a major stroke two weeks earlier. Among the estimated 4,000 mourners who gathered under a sprawling white tent at Israel’s national cemetery were dozens of foreign dignitaries, including President Francois Hollande of France, Prime Minister Justin Trudeau of Canada, and Prince Charles and former Prime Minister Tony Blair of Britain. By way of explanation, Aymen Odeh, the head of the Joint List of Arab political parties in Israel, said on Army RadioThursday, “I can tell you that it is complicated.” Odeh has told the Israeli media that Arab Israelis view Peres’ legacy as mixed, noting his role in the 1970s in expanding settlements and in the 1990s pressing for a peace agreement. Be the first to comment on "Saying goodbye to Shimon Peres, world leaders talk peace and love"